The PlayLimit is a simple token-based solution for setting limits on the amount of time your kids spend playing video games and watching TV. No More “Turn OFF That TV!” Arguments!! PlayLimit allows parents a simple and convenient way of limiting the time their children spend in front of a TV. Many studies have shown that too much TV is bad for children. Even educational video games and programs, if not restricted, can reduce children’s ability to think and learn for themselves. How can PlayLimit help? Simple. By giving kids tokens for a specific time period, parents set a definite limit on how much TV their kids can watch. What’s more, the tokens empower kids to manage their own time, so parents no longer have to be the “time’s up!” police. Once children understand their TV limits, parents can encourage other activities such as reading, drawing, and sports to fill the void. And that’s the ultimate purpose of PlayLimit — to be a positive experience for both parents and children. 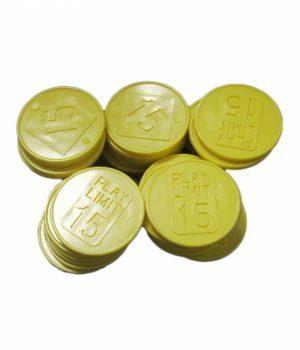 The PlayLimit system includes 40 tokens — each token allows 15 minutes of game playing or TV viewing. The PlayLimit system includes the necessary cables to connect to a game console and a VCR, DVD player, or cable television source. The large time display on the PlayLimit console warns you when play time is running out so you can save your game or add more tokens. A countdown timer also appears on the TV screen, the TV beeps at intervals. You can press the Pause button at any time so you can leave your game without being penalized. Parents have the key to the token box where they can retrieve tokens. The token box also is where the back panel of the PlayLimit console is secured, preventing cables from being removed. 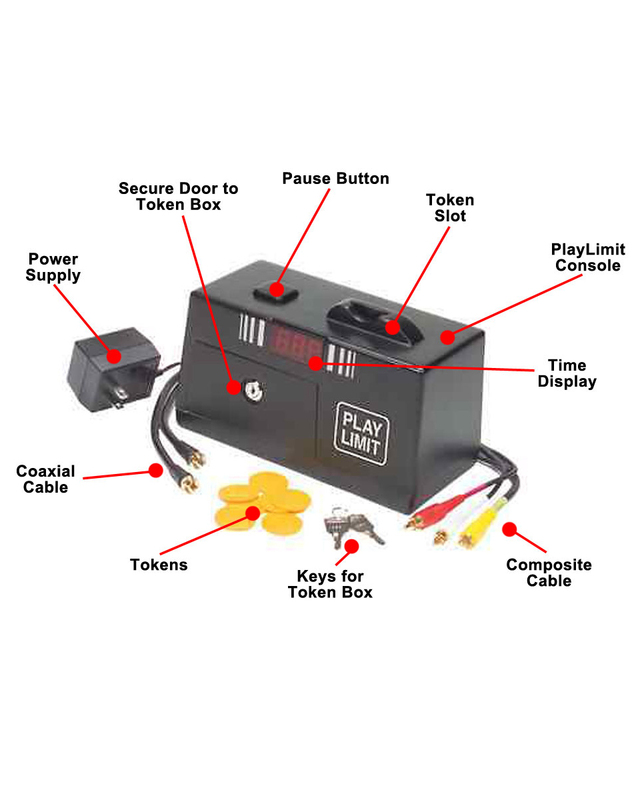 The token box contains switches a parent can set to allow unlimited play or prevent all play. Connection Type: RCA and coax audio and video connection. The PlayLimit does NOT support HDMI connections. Put a Token in the Token Slot – Each token adds 15 minutes of play time. The Time Display shows the amount of play time remaining. The timer starts immediately after you put in the first token. If Needed, Press the Pause Button – PlayLimit puts a “PAUSE” screen on the TV and the timer stops. The Time Display flashes the remaining time. Press the Pause button again to begin play. 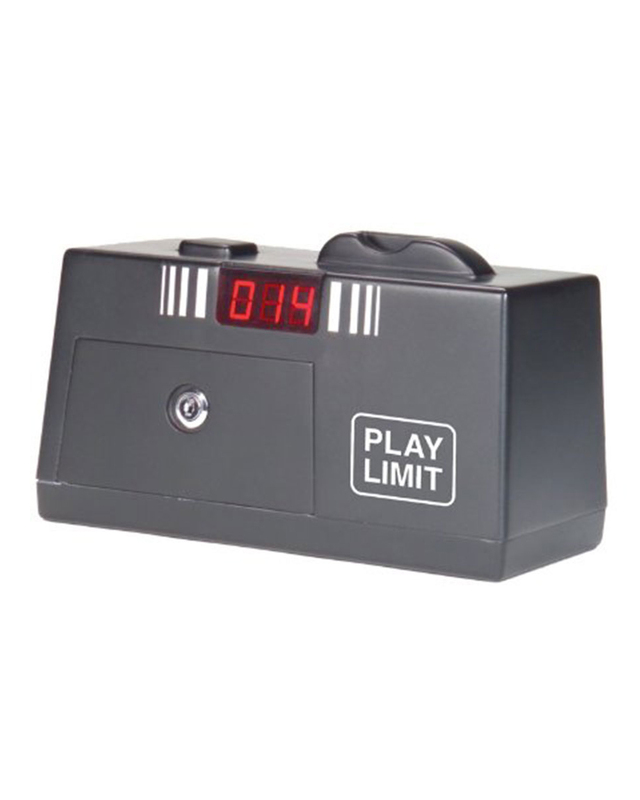 When Time is Running Out… – PlayLimit causes the TV to beep when game time remaining is at five minutes, two minutes, and again at one minute. When less than one minute remains, the Time Display counts down in seconds. When Time is Over… – When time runs out, the “Out of Time” message appears on the TV screen and the PlayLimit Time Display shows all zeros. Insert more tokens to begin play again! PlayLimit comes with a 30-day money back guarantee and a 90-day manufacture’s warranty.